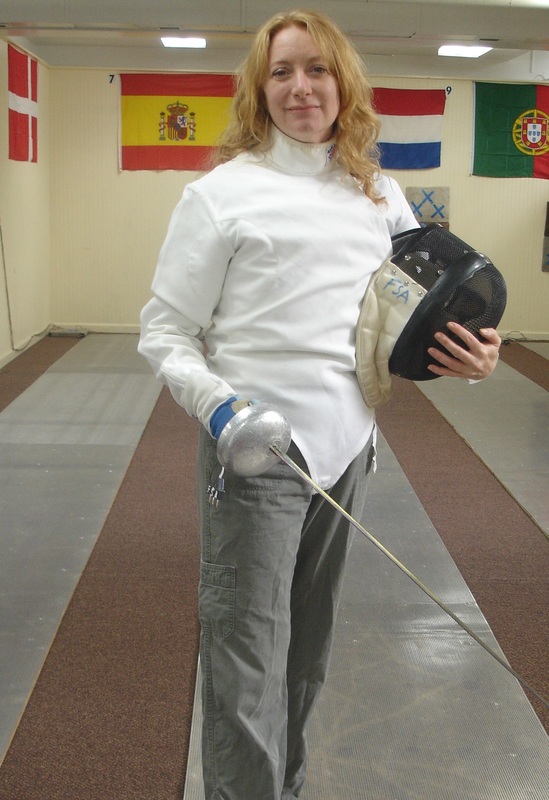 I love fencing. I think I have found my sport. And the teachers were super nice. I realize that I secretly want to be the Bionic Woman or Wonder Woman or some other superhero from my childhood TV. Not for the super strength, but because every week Lindsay Wagner, aka Jaime Sommers, the bionic woman, got to try new things. And it appears that what I am trying as my ‘adventures’ tend to be the things I grew up seeing actors in 70s-80s shows do: roller derby, demolition derby (coming this August), and, this week, fencing. Oh – and don’t forget the inspiring Charlie’s Angels. These adventures stuck in my head, and although I am mixing them in with activities that I never knew about as a kid (sea kayaking, or Korean drumming), I guess they always have been among my main bucket plans, as I seem to be more excited about them. So today I drove out to Fairfax to the Fencing Sports Academy, where I discovered that we had miscommunicated about which day I was coming. Yesterday was beginner adults, but today was private instruction, but in the end, that worked out wonderfully for me. They accepted my Groupon, and one of the staff took me on as her student for an hour. 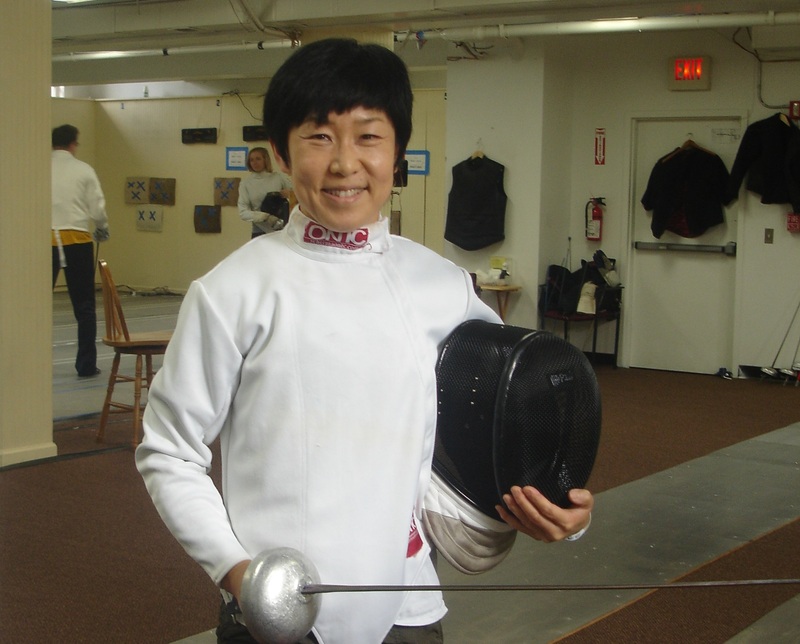 Yuki Riley, personal trainer, and a great fencing coach for a novice like me. 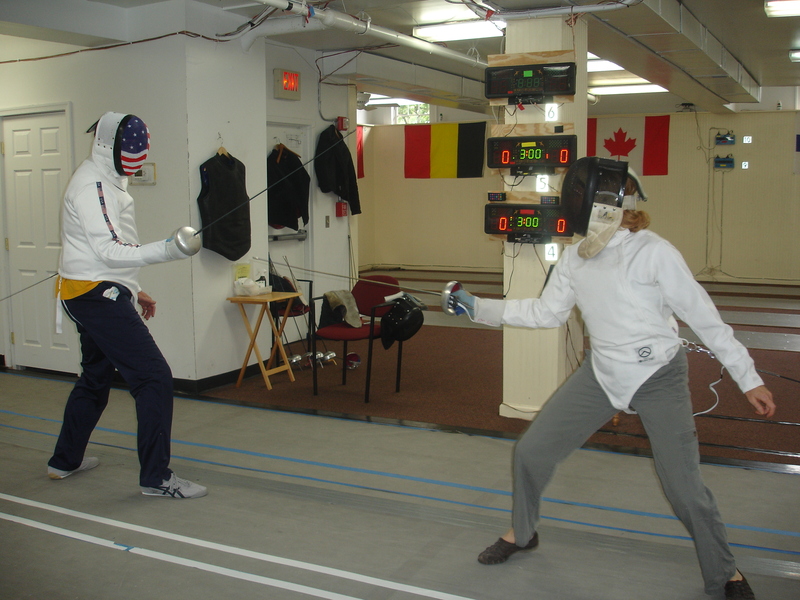 Being a little discombobulated at first with the one-on-one training – and so obviously not knowing a thing about fencing, except ‘en garde!‘, it took me a while to get settled in. But Yuki was great, and just walked me through the different types of swords (today was épée), equipment, and then the warm-up exercises. She just had a great personality, and we worked our way through the first set of steps: advancing, retreat, and lunge. Then we put on the protective clothing, which was not hot or smelly, as my friend Kari thought it would be based on the classes she takes her kids too. Instead, it was comfortable, and one feels professional wearing the ensemble. Also, having a power cord embedded in your sword, winding through your sleeve and shirt, trailing behind to a box, and being connected to an electronic scoring grid was interesting. Then target practice with the lunges – which I still need to get the hang of: sword out, then lunge. Footwork and balance are very key. I was beginning to get into this. The real fun began with the practice bouts, which I realized brought together many great things: memories of practicing sword fights as a kid, the footwork that reminded me of my dancing days and the mind strategy of avoiding the other sword while trying to get through and score a point. What a blast I had! Which is somewhat hypocritical of me since I am a self-proclaimed anti-gun pacifist and here I am having a sword fight. My first actual bout. I put up a good fight, and blocked many of his lunges. And yes, I see of course that my right foot is not aligned like it should be in my advancing step. I’ll work on that. The lesson ended with an actual bout with another adult student, while both teachers watched. The student was more seasoned (a couple of months) but worse than that, he was tall and had a long reach. I did an excellent job of blocking his sword repeatedly, but I could not get past to score. Ding! (not really) Lesson over. But I didn’t want to quit. I really was into this, and was already thinking that, based on my experience as a former amateur dancer, that I could be pretty good. I must go back for more! I am going to try to squeeze in a couple more lessons this year in among my adventures, I hope. By the way, I will never sky-dive. Although that is what led Jaime to acquire her super-strength, it also caused her to lose her memory, and I’m having trouble enough as it is. I am also terrified of heights. :-o.